Two sample breakout stocks for Week 12 with better than 10% short-term upside potential. YETI gained +24.80% last week. Two Best of the Dow 30 for mega-cap selections this week: McDonald's Corporation and JPMorgan. From inception now makes it 82 out of 96 trading weeks (85.41%) with at least one stock move 10% or greater within four or five days. 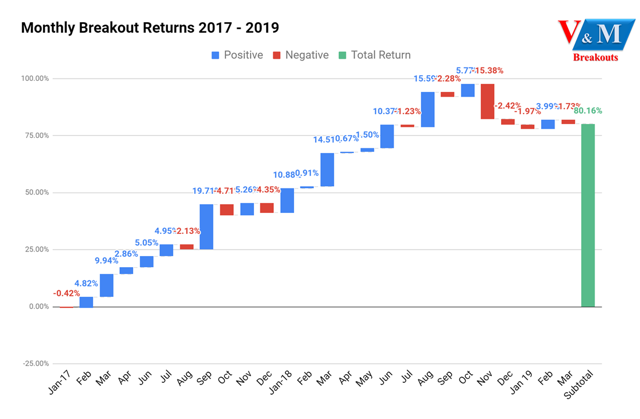 Total returns for the Breakout Stock selections since 2017 are +80.16% compared to +20.29% for the S&P 500 over the same trading period. The two Breakout Stocks to start the week consist of one healthcare and one technology sector stock. Mar-12-19 12:17PM Is Rigel Pharmaceuticals, Inc.'s CEO Overpaid Relative To Its Peers? Simply Wall St.
Rigel Pharmaceuticals, Inc., a biotechnology company, engages in the discovery and development of small molecule drugs for the treatment of immune and hematologic disorders, cancer, and rare diseases. The company's clinical programs include Tavalisse, an oral spleen tyrosine kinase inhibitor for the treatment of adult patients with chronic immune thrombocytopenia, and Phase III clinical study for autoimmune hemolytic anemia. Mar-07-19 09:03AM Can You Imagine How Travelzoo's Shareholders Feel About The 97% Share Price Increase? Simply Wall St.
Feb-18-19 12:50PM Travelzoo Is Employing Capital Very Effectively Simply Wall St.
Travelzoo Inc., together with its subsidiaries, provides travel, entertainment, and local deals from travel and entertainment companies, and local businesses in the Asia Pacific, Europe, and North America. The company's publications and products include Travelzoo Websites; Travelzoo iPhone and Android applications; Travelzoo Top 20 email newsletter; and Newsflash email alert service. Caution: These stocks are not necessarily recommended for long-term buy/hold unless you are comfortable with very large price swings. These are the most volatile selections I offer from among all the different Value & Momentum portfolios. Entry price points are highlighted in yellow as a general point of entry as market conditions allow in the next trading session. Members of my service receive these selections prior to the close on Friday. The total all-time return of the Breakout Stock picks (worst case) using a fixed five-day equal weighted buy/hold return period is shown in the waterfall chart above. These picks are measured as a fixed baseline for worst-case scenario since this model began in 2017. Cumulative Gain by Friday of the Week: -0.77% (Worst case) No adjustments for earnings surprises, events, or technical changes during the week. 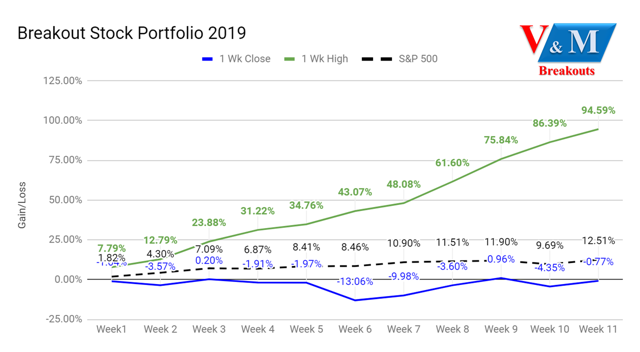 The evidence is strong that you can outperform the worst-case, fixed, one-week, equal-weighted, minimum return measurement shown above in the 1 Week Close (blue line). Selling many of the breakout selection gains prior to Friday has resulted in +94.59% return YTD (green line) best case. From the eight most recent selections, the best returns were achieved in fewer than four days with an average top gain of 9.38% per stock. Idiosyncratic events will occur that the model cannot anticipate (e.g. earnings surprise, CEO resignation, SEC investigation, etc. ), so it is always a good strategy to hold a basket of stocks to diversify unpredictable risks. Above-average momentum continues in prior weekly breakout selections: YETI Holdings (YETI), Abeona Therapeutics (ABEO), W&T Offshore (WTI), Akebia Therapeutics (AKBA), Earthstone Energy (ESTE), Aqua Metals (AQMS), FormFactor (FORM), TechTarget (TTGT), Daseke (DSKE), and Finjan Holdings (FNJN). Momentum values have improved significantly during the past five days. 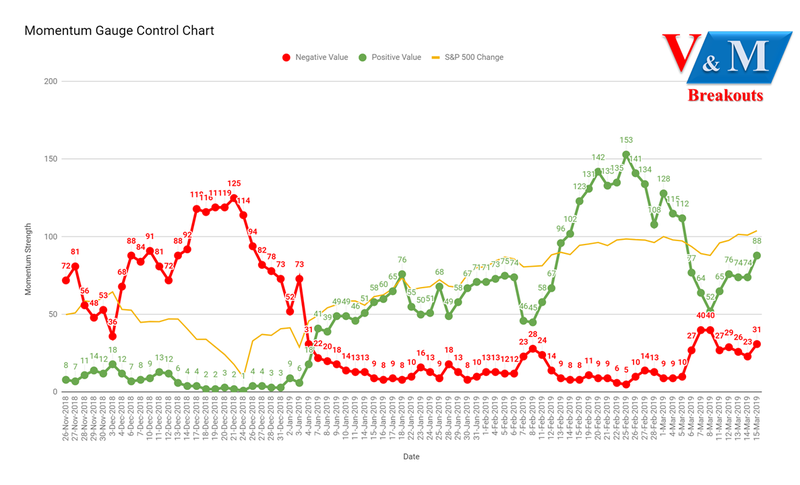 Conditions are still below the 100 positive momentum value, but rebounding very well to the S&P 500 change line (yellow). Conditions have returned to a more favorable outlook based on Fed policy updates and positive macroeconomic conditions. The S&P 500 has held above the critical 2,800 level and may encourage more investors to get off the sidelines for new potential market highs. Avoid/Minimize trading when the Negative score is higher than the Positive momentum score. Avoid/Minimize trading when the Negative score is above 70 on the gauge. Applying the same breakout model parameters without regard to market cap or the below-average volatility of mega-cap stocks may produce strong breakout results relative to other Dow 30 stocks. All the indicators are in positive breakout conditions with positive net inflow and a likely retest of 190/share resistance level in the short-term. Price has broken out above the negative price channel from September with all technical indicators in strong positive breakout condition. 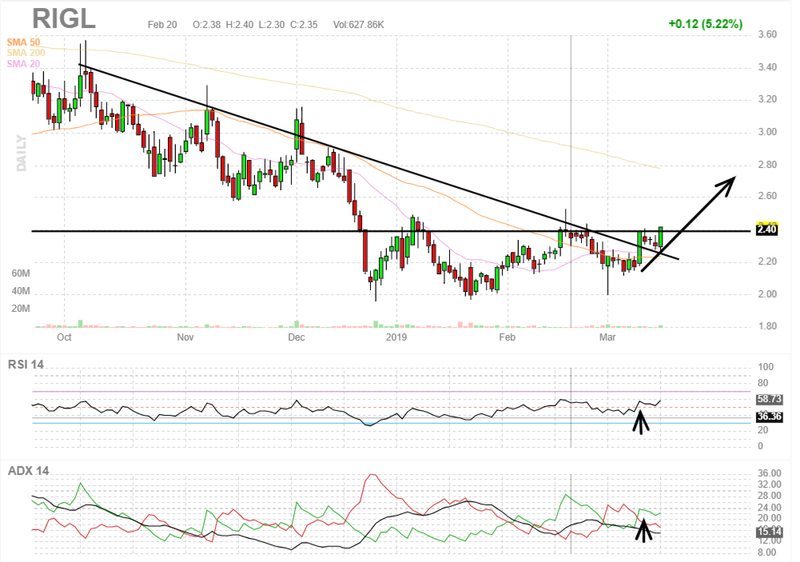 Very good setup for price move above 110/share and higher short-term. 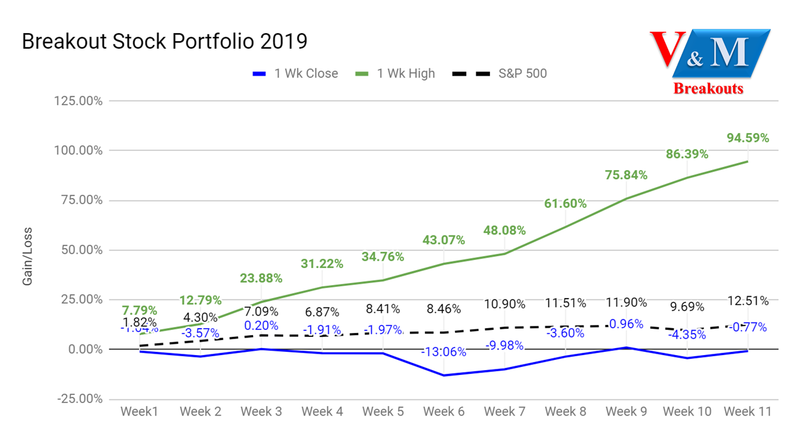 All of these key weekly and monthly selections feed into the Premium Portfolio database selection model portfolio that is now up 25.18% YTD with 28 stocks gaining more than 10% and as much as 66.21% since January. All the very best to you and have a great week of trading! Subscribe now and learn many new models and techniques for short and long term trading success. Members receive active trading alerts and live stock picks well ahead of published articles. Now into our 3rd year, this rapidly growing service has consistently outperformed the S&P 500 every single year with returns as high as 90% - even across different portfolio models. Disclosure: I am/we are long RIGL. I wrote this article myself, and it expresses my own opinions. I am not receiving compensation for it (other than from Seeking Alpha). I have no business relationship with any company whose stock is mentioned in this article. Additional disclosure: I may initiate additional positions as early as Monday.